Using invisble inks to protect your products against counterfeiting is a simple and effective way as you can create your own color combinations, your own screen rulings and screen types and your own layout. No scanner in the world will be able to copy what you design. The use of invisible inks requires a densitometer to control ink layer and dot gain as you are used to do on every day work with process colors cyan, magenta, yellow, and black. 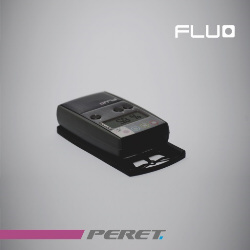 The FLUO is the Invisible Inks densitometer that makes you brand protection items stable over time.